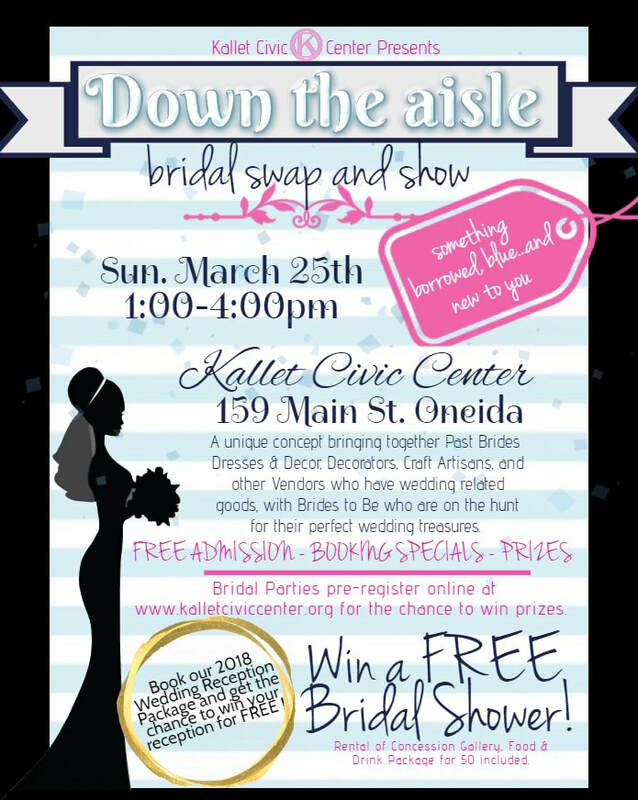 The Kallet Bridal show is back and better than ever! Join us for a unique experience where bridal vendors, craft artisans, and Past Brides join together to make your special day even better! Brides to Be that register online will be entered to win a free Bridal Shower! Be sure to take advantage of our 2018 Reception Special! Vendors join us for this year's show! Sign up below to reserve your spot today. Anchor vendor spaces available, sign up early to choose your location in the ballroom. Are you a past bride looking to sell your centerpieces and gently used decor items? Register your items below. Items must be tagged and dropped off at the Kallet on either March 22nd or 23rd between 11am and 6pm and must be picked up by March 31st at noon or they will be donated. This year Past Brides are invited to consign their clean, gently used bridal dresses at the Kallet. Sign up your dress below! Dresses can be dropped off by appointment and must be picked up by march 31st at noon or they will be donated.